H-alpha proms, 14 september 2018 - SolarChat! Changed the focuser of my 150mm PST mod, the optical train seems more straight now. Effect was that I had less reflections and a bigger "sweet spot". 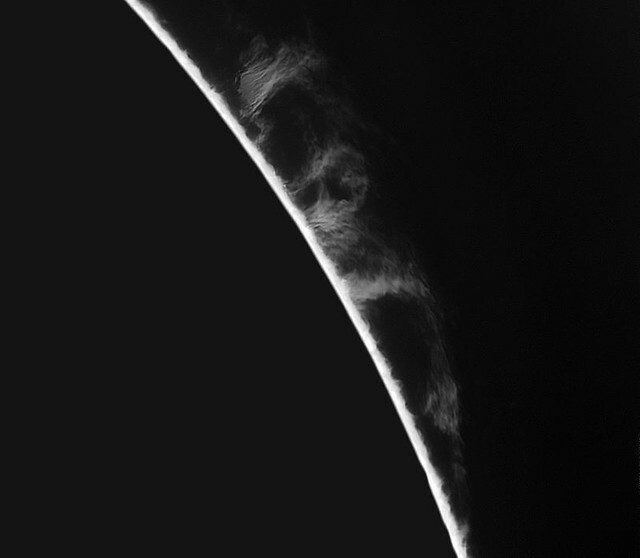 Seeing was not too good yesterday, but managed to image some nice proms. 160 mm D-erf / 150 mm f/8 Skywatcher / 1,25x Glasspath / Baader 35nm H-alpha / PST-etalon / Lunt BF 1200 / 2,5x Powermate / PGR Grasshopper IMX 174. Processing was done in Photoshop.